Treat yourself to a little luxury from The Plaza Hotel! This limited edition set includes Eloise Doll, Eloise picture in a little frame, Plaza Hotel peppermint lotion, Young Plaza Ambassador's passport, doll-sized Eloise cup & saucer. 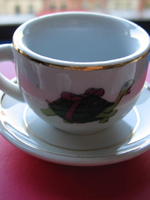 Here's the thing of it....the cup has Eloise's turtle Skipperdee on it and the saucer is monogrammed with an "E". (For Eloise. of course!!) We've also included one or two of Eloise's lucky buttons, with the gold-plating maybe a little worn from its service on the doorman's coat or maybe just from Eloise rubbing it in her pocket! These are some of Eloise's favorite things from the hotel -- all in three matching hat boxes! The large hatbox has a gold seal on top with The Plaza signature and logo, and each gift set includes a complementary official Eloise of The Plaza gift card. The doll is 18 inches tall and is sporting the traditional Eloise uniform of pleated black skirt, white socks and Mary Janes etc. 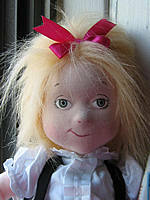 This is a cloth doll. 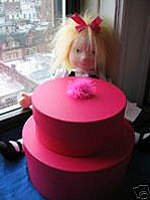 She curls up inside the large hatbox which is complete with a gold seal from The Plaza Hotel. 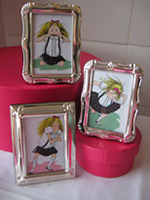 Note the Eloise pictures and frames vary. The three shown in the photo are typical. A gift set includes one framed picture. $125 plus shipping ~ Exclusively found here! 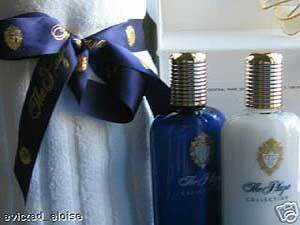 The Plaza Hotel had toiletries of the highest quality made to order. Their specifications were demanding. Only the best would do for their guests!! Along with the room sized toiletries, a larger 4 ounce size was also produced to sell exclusively in The Plaza Gift Shop. This gift collection includes one bottle each (the generous 4 ounce size!!) of the shampoo, body wash and body lotion. These goodies are all packed up in a little carrying case which clearly displays "The Plaza" and the double P logo on each side. The gift box itself, tied with a metallic gold ribbon and bow, measures 10 inches long, 5 inches wide and eight inches high. It has a little handle. This is a beautiful presentation and would make a spectacular gift! Frette Linen is one of the most prestigious textile companies in the world! Don't miss your opportunity to experience the spectacular spa feeling this mat will bring to your bathing experience! NOTE: The pink rosebud soaps and pajamas shown in the photos are not included in the gift set and are no longer available. Along with the room sized toiletries, a larger 4 ounce size was also produced to sell exclusively in The Plaza Gift Shop. 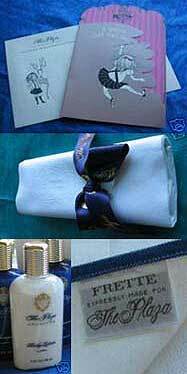 This gift collection includes a bottle (the generous 4 ounce size!!) of the body lotion. • a pair of Plaza women's slippers! These slippers are luxurious white terry monogrammed with the famous blue "double P" logo of the Plaza Hotel! THESE ARE NEW AND IN ORIGINAL PACKAGING!!! We mustn't forget the very important "Do Not Disturb!" or "Privacy Please!" sign, that any self-respecting hotel room would have! 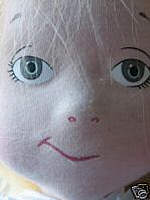 to hang on your door. Both sides have The Plaza in script & the logo. One side has Privacy Please...the other Please Service Room in five or six languages. A wonderful little piece of silverplate, this sugar bowl is made by Morton-Parker, the maker of Canada's finest holloware. It is made of solid heavy-gauge nickel silver, hard soldered and heavily deposited with 99.9% pure silver. Although it is a sugar bowl, it looks to me like it would make a great baby cup or little vase. To add something special, I've filled this silver plate cup with a dozen foil-wrapped chocolate mints from The Plaza Hotel. These "turn-down-service" candies are wrapped in gold foil which has The Plaza's famous double p logo on it in either blue or purple. This elegant piece would make a beautiful gift for a shower, birthday or any of the upcoming holidays! Once the chocolates have been polished off the little bowl or cup can be enjoyed as an heirloom piece by upcoming generations. I'm including two elegant white gift or placecards so that you can add your own personal finishing touch to this wonderful gift. These little cards both have the famous "double P" logo in gold foil. The bottom of the cup is marked. I can't make it all out, but what I can read looks like this. Full of Authentic Little Luxuries ... Including a Pair of Slippers! The Plaza Hotel had toiletries of the highest quality made to order. Their specifications were demanding. Only the best would do for their guests!! Along with the room sized toiletries, a larger 4 ounce size was also produced to sell exclusively in The Plaza Gift Shop. This gift collection includes one of the generously-sized 4 ounce bottles of body lotion. You can add a touch of Plaza elegance to your holiday gift with the elegant Plaza gift card that will be included. The card is new and white with the Plaza logo in gold. There are two slots to hold the corners of a business card if desired. It is a beautiful presentation and would make a spectacular gift! The Plaza Hotel, New York. A Plaza tea party package to go! This box includes one BRAND NEW Lenox Aristocrat Cup & Saucer. This elegant pattern was discontinued by Lenox in 1992. The cream china cup and saucer have an exquisitely detailed gilt band along the edges. The gift box also includes a sealed tin of Plaza Hotel teabags, ten paper guest towels, a gift card and a silverplate tea spoon with the famous double P logo of the hotel on the handle! "A Tea at the Palm Court Package"
from The Plaza Hotel, New York. The set includes a hotel silver tea pot that has the famous double P logo on the side as well as "The Plaza N.Y." marked on the bottom. This teapot is a rare find. (Even the teapots sold at the Christie's auction in March didn't have logos on them!) There is no wear to the silverplate and the inside is clean and ready to use! A mint condition silver teaspoon with the hotel's logo along with a Frette table runner are also included. The runner is tied with authentic Plaza Hotel logo ribbon. These are the same pink, checkerboard 100% Egyptian cotton table runners used at the hotel and sold at the Christie's auction. We can't forget the tin of Plaza Hotel English Breakfast Tea in a collectible tin! Nor can we forget the tiered cake tray to hold those petite fours, cucumber sandwiches, scones and other wonderful "high" tea treats we all love! !